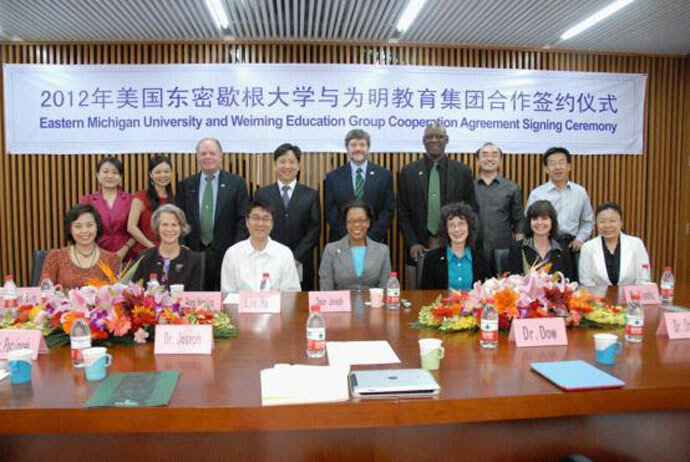 On May 7th, 2012, a delegation of 8 people led by Dr. Jann Joseph, the director of Education Department of Eastern Michigan University (EMU), came to the Headquarter of Weiming Education in Beijing for a six-day visit in Weiming Education Group and its affiliated schools. The purpose of EMU delegation's visit was to confirm the cooperation intention of both sides by signing MOU of strategic cooperation, which was reached by the principals delegation from Weiming when they visited the US in January this year. Besides, the EMU delegation had especially visited four schools of the Group including schools in Shenzhen, Wuhan, and two schools in Chengdu. They also had extensive communication with teachers, students and parents about the education and teaching. Meanwhile, the delegation attented the signing ceremony of “EMU Teachers' Training Base” and “EMU Straight Track Project”. At 9 a.m., President Lin Hao, senior leaders of the Group and related staff members had warmly welcomed and discussed with the EMU delegation. In the meeting, President Lin Hao had made passionate remarks to welcome new friends and old friends from EMU. International communication and cooperation was farmiliar to EMU and Weiming, but this time it had different meaning. First of all, they were faced with different situation. In the development of recent decades, the educational communication between China and the US had become important and urgent. Many far-sighted parents had predicted the future trend that childern from the US and China should understand and know about each other from a very young age, in order to better cooperate with each other in the future. Therefore, our cooperative model would be different from the previous ones, we should seek for a long-term stable cooperative relationship. As a private educational Group, Weiming not only pay attention to cooperation in academic field, but also hoped to achieve long-term stable benefits to both sides during cooperation. Weiming hoped to establish a cooperative platform, and create a model system which could actually integrate the advantages of Chinese education and the US education. By making sustainable efforts, Weiming could let children in the system to adapt to the society and culture of the US and China faster and earlier. As to the cooperative model, Weiming and EMU needed to build a long-term stable cooperative relationship. It took time for practice to integrate the advantages of basic education of China and the US, but not limited to using academic thinking and communication. The goal was to integrate Chinese and American education, not simply turning Chinese education into American education, but combining the two. That was because Chinese and American education had their deficits and strengths. In fact, Chinese children could not grow into American children, and vice versa. But they should learn from each other and understand each other. In the aspect of development, now more Chinese children were going to the US, but ten years later, maybe more American children would come to China. So the cooperative platform we built should meet the long-term needs for future social development. The other difference in our cooperation was the difference in people. EMU and Weiming were outstanding educational institutions in their own country, and we could feel each other's sincerity and enthusiasm during our contact. In Chinese tradition, we cherished the saying that the fate brought us together, so mutual understanding between both sides was more important. Thus we sincerely welcome the delegation from EMU to come to Beijing, and hoped we could establish a long-term stable cooperative relationship gradually. Ms. Joseph was grateful for Weiming's invitation. Yesterday Weiming and EMU had a very good time together. EMU delegation shared the same thoughts with Weiming, and wanted to establish a long-term stable cooperative relationship to fight for a better future. The MOU that Weiming and EMU were going to sign was not only related to children and education, but also the future of education in both countries. Weiming and EMU had looking forward to such cooperation for a long time. The contract period would last for 4 years, in fact it was a long-term cooperation, so this was just the beginning. EMU were very grateful for the work Weiming had done in previous four months, the work had been carried our promptly and smoothly. EMU shared the same perspectives with Weiming. Since EMU and Weiming had their own course structures, they wanted to find out the best parts of both sides, and combine the advantages. EMU hoped to learn more about Weiming's new model, such as teaching method, better way to manage the school. EMU hoped to know more teachers and students in the following journey. In the meeting, President Lin and Ms. Joseph had expressed their expectation and confidence in the cooperation. A Signing ceremony of "the MOU between Weiming Education and EMU" was held. Staff from both sides had discussed the cooperative details such as dispatching teachers and had reached satisfactory results. Later, President Lin hosted a lunch for our guests from the US. The signing of MOU between Chinese and American education had symbolized the commencement of internalization of Weiming Education. It also served as the bridge between the two countries, and lay strong foundation to speed up the 345 Project, and internationalizing school running of each school. After the lunch, the delegation had been transferred to Beijing International Airport to continue their tight but wonderful Weiming Journey. 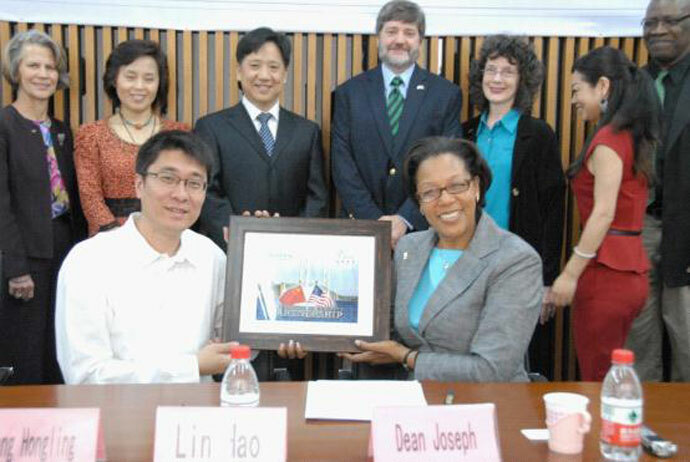 Dr. Jann Joseph gave President Lin picture of "Cooperation Bridge" as a gift.